“How you spent your summer, where they spent the past” contest, but hadn’t gotten around to it. I knew how ridiculous this was. I was literally going out of my way just to put myself in a position of thinking about nature and the past. 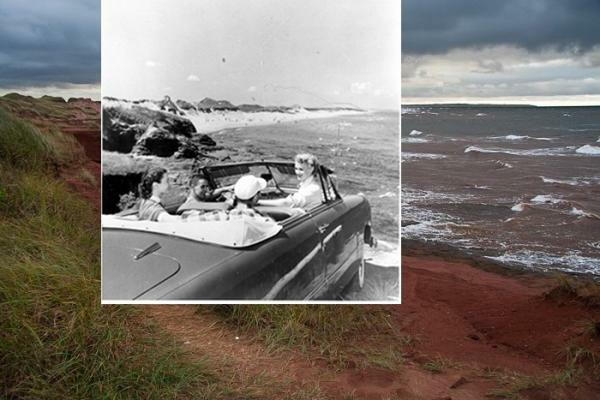 (And not deep thinking either: what attracted me to the ‘50s photo was the car’s insouciance, practically sitting on the surf – people demonstrating their love of nature by parking on it.) Given the work and gas I was putting in, how could any historical thinking I would have be in any way genuine? When I arrived at the parking lot overlooking the beach, there was no one else there, the sun was rising, the wind blew, and the land and the sea were beautiful. I got to thinking about the great month I’d just had on the Island, then about how lucky I am to be living when and where I do, then about how this park and any history I might write about it doesn’t really amount to a hill of beans in this crazy world, and then about how all that I was looking at, all of our modern existence, was oh so fragile. That is, I was in full Linda Hamilton, end of Terminator mode. A hazard of reading and watching so many narratives, or maybe simply getting older, is that those narratives inevitably come to remind you of other narratives. The more you read environmental history, or any field, the more the tropes become familiar, repetitive. It can be difficult to see something fresh in what you’re reading. Or writing. You can become cynical about your own interest in the field. As I stood there, three red foxes ran out of the dune grass. I followed them down toward the water. I sat down on the edge of the bank, swung my legs out over the province, and for fifteen minutes watched them gambol – yes, reader, gambol – together along the shore. Then I stood up, got in my car, and drove to Ontario. — The deadline for the “How you spent your summer, where they spent the past” contestfast approaches. We have some great entries, but look forward to getting more. Happy end of summer.